The Suzuka Quasi-national Park is designated on July 22, 1968, centered on Suzuka mountainous areas that are also widely spread across Mie prefecture. The total area is 29,821 ha, the Shiga prefecture's holding area is 17,113 ha (about 57%), Higashi Omi City owns 8,461 ha, which is about half of that. Oikigake (1,247 m) in Kimigata-cho is the tallest mountain in the Suzuka Mountains, the third highest mountain in Shiga Prefecture. In Suzuka Quasi-national Park, there are many mountains beyond 1000 m, including Fujiwara dake (1,128 m) and rain-falling dake (1,238 m) besides Mikake Volcano. In the Suzuka Quasi-National Park, rich nature is spreading and lots of rare plants and living things. Around the top of Oike pond, there is also a group forest of "Ouita yayakui (Maple family)" spreading, which is also designated as "100 nature of Japan want to leave in the 21st century", and there are other special natural There are inhabiting and growing more than 1,800 species of precious animals such as birds and insects such as monuments and insects, amphibians and reptiles. This is far more than the 1,500 vegetation number of Ibukiyama, it is said to be the "Shika prefecture's first" nature-rich quasi-national park ". 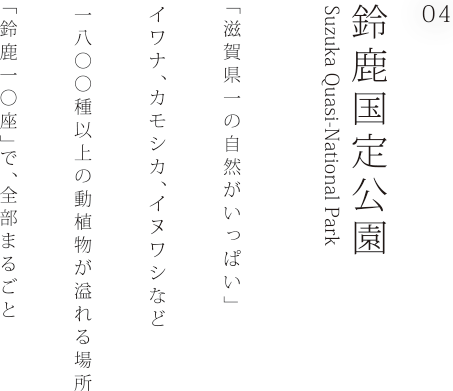 The characteristics of Suzuka Quasi-national Park can be divided into four major environmental conditions. First, the northern region is influenced by the "Japan Sea side climate", and the southern region is influenced by the "Pacific climate". In addition, the northern region of Fujiwara dake from Oike pond is "limestone zone", southern region from Budapestake to Oilidake is "granite zone", so the Suzuka mountain range is positioned to "break west Japan and eastern Japan" here So the vegetation phase of living things is characterized by increasing diversity and becoming complicated. For the 10th anniversary of the Tohni river municipal government, we widely disseminate the wonderfulness and existential significance of the Suzuka mountain range, and in September 2015, with the aim of succeeding to the next generation the rich forest resources and water resources supplied from here , I certified 10 loci from the mountain peak of Suzuka in Higashiomi City. This selection does not select only the well-known mountain peak, but it is a key point of the catchment area of the Aichi River, which is a typical river flowing into Lake Biwa, to evaluate mountain peaks familiar to people since ancient times , It was selected by the "Suzuka 10th Season Project Committee" as a thing that "Higashi Neighborhood" can be emphasized. The station on the road that opened on October 10, 2015. A mountain village scenery where Japan's original scenery remains remarkable, a road station where the first and only Japanese school (the government junior high school) was born, as it is, on the natural rich land where Aichi River flows, which is one of the sources of Lake Biwa . As a base for the local life such as disaster prevention and medicine, as well as function as sales promotion, information dissemination to the visitors from the Chubu area and a place for relaxation, which is rapidly increasing in the opening of the Ishikawa Tunnel of Route 421, It also has functions and community functions, making it a facility that also supports the living support of local residents. At the road station, there are community center / city office branch, exhibition corner, clinic, snack corner, merchandising / special product corner, information corner, etc. In addition, free WiFi spot is maintained and the product produced or processed at Higashi Omi Other than that, local specialties such as "Eigengenji Konjac", an insignificant tea "politic tea", rocky fishes that only live in clear streams, fresh and thick "honey" collected from honeybees flying naturally rich mountainous areas . Everyone's in Oku Eienji Temple has 8 campgrounds and information on various outdoor services. Shiga Prefecture Please pay attention to campsite information and outdoor service, which is full of nature, you can enjoy the wilderness of Suzuka Quasi-national Park. Why do not you enjoy the "Nature at Suzuka Quasi-National Park" with us?